What's the highest efficiency a Solar-thermal power system could have? J.H. and J.G. say: The atmosphere is essentially a large heat engine that converts incident solar energy to mechanical energy with an efficiency of about 2%. And they point out that solar thermal electricity production (in which sunlight is first converted to heat) is far less efficient than an ideal photovoltaic system. Now, let's add an ideal thermal power plant on the back side of the body, which takes heat from the hot body and sends it to a cold body and extracts mechanical work along the way. 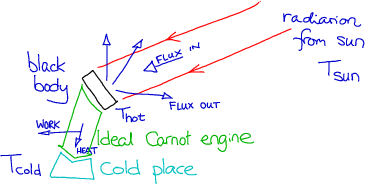 If the hot body's temperature is Thot and the cold sink's temperature is Tcold, then a heat flux Q per unit area from the hot body produces a work flux W given by W = Q (1 - Tcold/Thot) Sucking heat out of the back of the hot body leaves less energy to come out of its front. So the more heat is sucked out of the hot body, the lower its equilibrium temperature is. Our task now is to optimize the temperature of the hot body so as to maximize the work done. For convenience, let's redefine Q to be the ratio of the heat going into the heat engine to the total flux incident on the black body. And keep the definition W = Q (1 - Tcold/Thot). Then W is the efficiency, that is, the fraction of the incoming solar energy that gets turned into work. We are now ready to bound the efficiency of a range of solar-thermal devices. Our model omitted the greenhouse effect produced by having an atmosphere in front of the black body, but for the moment let's fudge this in by simply positing a few numbers. hot packets of air move slowly and adiabatically to colder locations, where they are cooled down. As the packets drift around, they do mechanical work. Not a Carnot cycle, but if it were, its efficiency would be (1- Tcold/T)2. Here, T is the average equilibrium temperature of a black body in windless conditions - say 300K?, and Tcold.... hmm, should we pick a polar temperature, or a stratospheric one? Let's say	Tcold = 230K, a good Canadian temperature. Then the maximum efficiency, if the wind whooshes at the right speed, is (1- Tcold/T)2 = 0.055. The most promising design for a massive solar power station seems to be 'concentrating solar power' (CSP). Mirrors are used to make it feel, from the point of view of the black body, that it is surrounded on all sides by hot sunshine. With perfect spherical mirrors tracking the sun, the factor (rsun/Rsun)1/2 is eliminated. The factor f is also eliminated if we remember to run the system only when it's sunny. (An option not available to the weather system.) 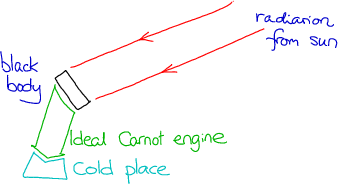 The cold side of the heat engine is air or water at a temperature something like Tcold = 290K. 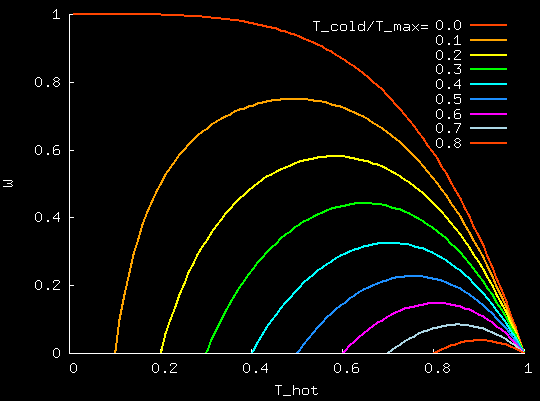 Assuming perfect optics we have a maximum possible equilibrium temperature T equal to Tsun = 5000K, and the efficiency could be (1- Tcold/T)2 = 0.89. However, most materials out of which power stations could be made would fall apart at the corresponding hot working temperature of 2500K. If we plug in plausible hot and cold temperatures of 900K and 300K instead, we get an efficiency of about 66% (eq.1). Thus a solar thermal power station with perfect concentrating mirrors could deliver a power per unit area of at most 2/3 times the solar constant, at midday.